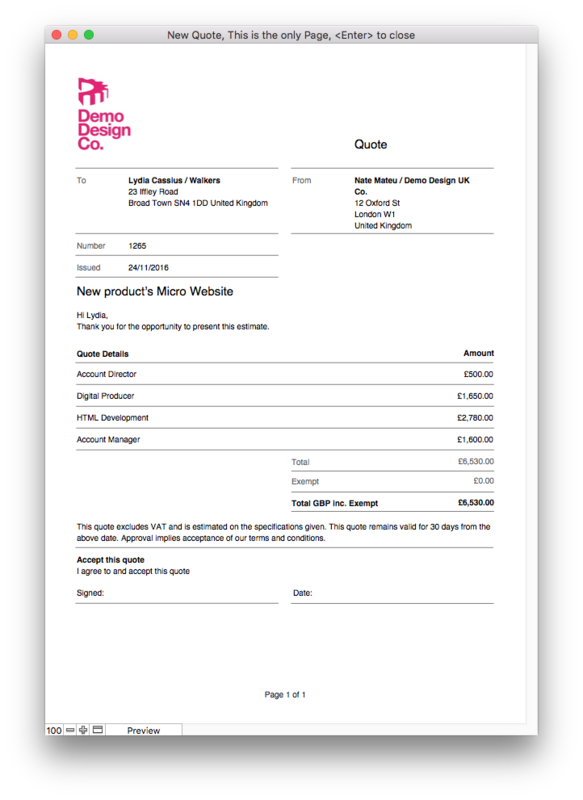 How do I customise my Order, Quote or Invoice templates in Streamtime Classic? If you want to customise your stationery templates (known as PrintForms in Streamtime), there are several options available to you. We changed our default templates to match those in Streamtime Web (see below), which you can have free of charge; please note any pre-existing customisation will be lost as these templates replace what you have. Still like this idea? Drop us a line and we'll hook you up. If you only have minor changes to make to your existing templates, the following articles will help you do this yourself. Streamtime version 9.0v3 and above offers the ability to customise your default templates in Layout mode; if you want to make substantial changes, read on. Are you really sure you want to go down this rabbit hole? If so, proceed with caution! These forms have the ability to take up a large amount of time; Filemaker is not particularly design friendly, making edits precarious work. If you mess up your forms and require our help, you will be charged £150 per hour. In this case, our preferred option will be to reinstate a backed up form (cheap for you); if this isn't possible then we'll fix your current form (expensive for you). Duplicate the PrintForm you want to edit and make it available in the Print Centre popup window, via the Print Forms Manager in your Streamtime Setup area. Making changes to the duplicate version of your default form will allow you to refer back to the default form as a guide. We've created a short video that will step you through the process of accessing and editing your forms. - How to fix printforms when text is getting cut off - enlarging and reducing the size of an object on your printform. - Why is my Quote/Invoice printing over multiple blank pages?